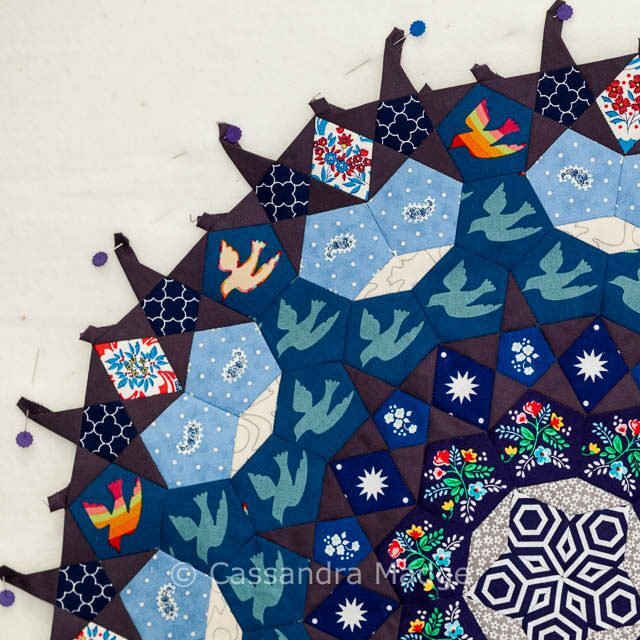 It’s been a bit of a slow journey since I started my La Passacaglia in January this year, however I am so happy to share with you another two rosettes, and with this update I have officially finished the four large cogs. 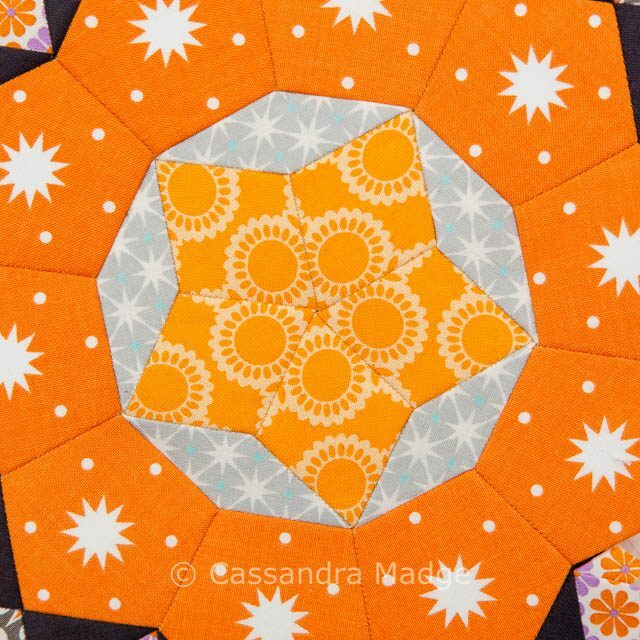 I just love this little piece of sunshine – the orange is so fresh and just the hit of colour that I think this quilt needs. Again, I couldn’t help myself and went overboard with the fussy cutting. If you are waiting with bated breath for my long promised fussy cutting tutorial *guilty face* I haven’t forgotten you. I just had some urgent deadlines that I have been taking care of behind the scenes, but it will arrive, I promise! Here is a bit of a closeup of the centre star with a lovely flower I created. 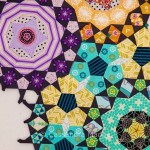 Some of these fabrics really can be used to make such a variety of patterns, it all depends on which way you place them. This final large rosette is designed to make an impact – and it sure delivered. I did have to go shopping for some of the feature fabrics, as I was surprised how few of the navy/royal blue family I really did have. However what I managed to create out of them is such a joy to examine. The centre star/flower is created out of a simple geometric print of echoing hexagons. Outside of that is a tiny grey dot and a navy floral. I was careful in how I cut each bouquet out and made sure that they were all positioned in the same orientation around the circle. 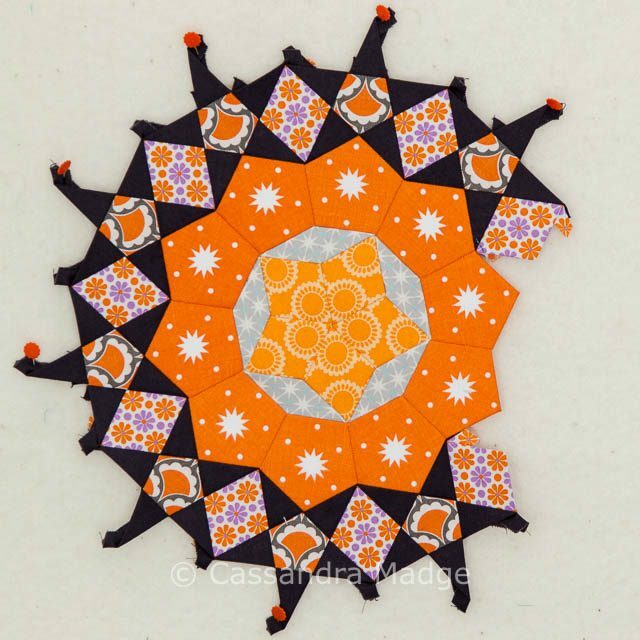 You will recognise the navy stars in the inner diamond row as the same print as the orange ones in the rosette shown above, however they do look different due to the shape that I used to highlight them. 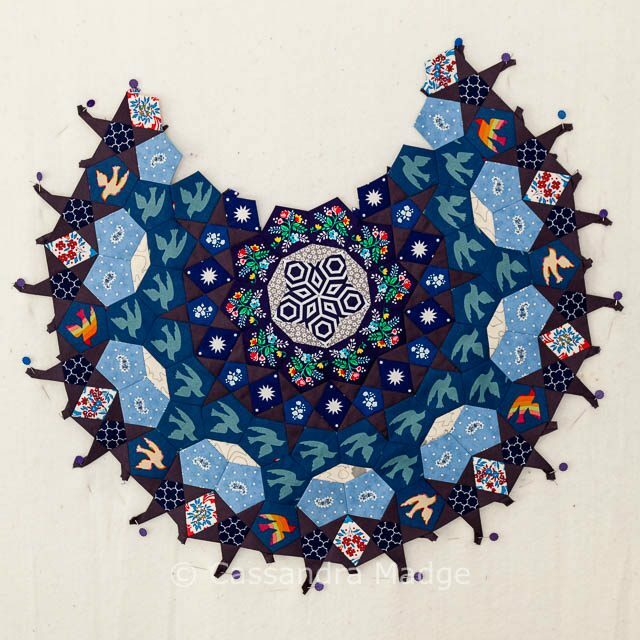 Again, I cannot take credit for the arrangement of the pentagons in the outer rings – it was another idea the inspiration for which I borrowed from the Millefiori Quilts Facebook Group. I love the way it looks like the pale blue paisley print forms a circle around and underneath the birds, which are flying with much abandon around the ring. I threw in the alternating rainbow and cream birds around the top row to tie back into the bright floral print of the inner pentagon rows. That also worked well with the fabric I used for the diamonds which were definitely stretching the “blue” theme a little bit. 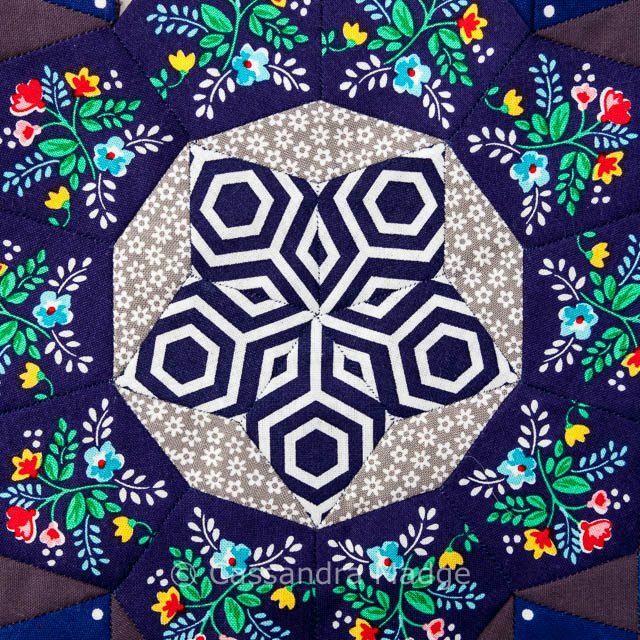 I was concerned about how “dark” this rosette appears to be with the navy fabrics, however I think it will serve to balance out the rest of the quilt very nicely. So, as you can see from this updated layout, I am well on the way to filling in the outline for the original design. I am seriously considering making some changes regarding the cropping however, as I absolutely refuse to create so much, only to trim it off again. It doesn’t make a lot of sense to me. Of course, because I am the impatient type, I am planning on starting to pair up and join some of the rosettes soon as I work out where I want them. I’m trying to keep a good balance of colour, light and dark across all the rosettes. Hopefully this way I can work out what I need to fill the empty spaces, rather than just making them at random and hoping for the best. 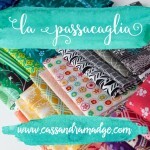 If you would like to see close up pictures of all my previous cogs, click HERE for all my La Passacaglia posts. So, am I over-thinking this, over planning it? Would you do the same? With the amount of work going into it, I’m never making this quilt again, and I simply want to make it incredible the first time. I’d love to hear your thoughts in the comments! 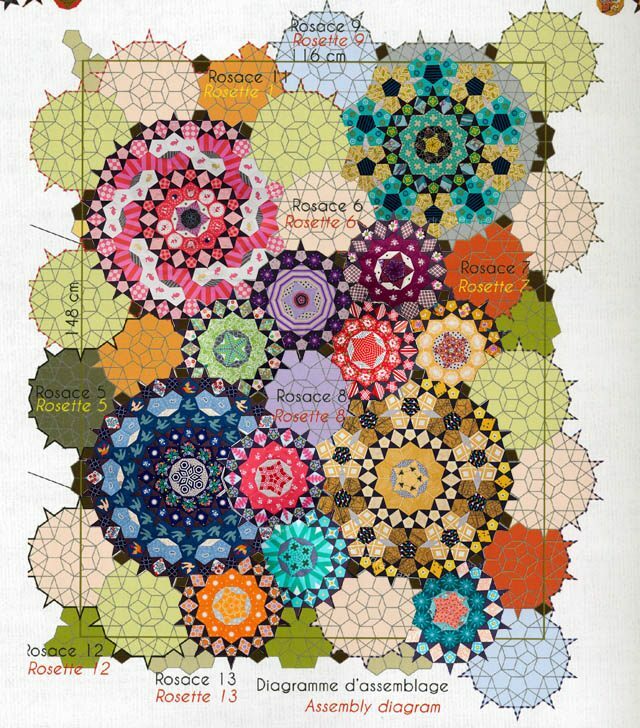 I’m impressed how you have your own fabrics in the layout sketch – how does that work? pattern where the sides nestle into the opposite side so to make into a square you actually sew the whole into a tube & then slide the cutting board in to make the straight cut. When done, you sew the other two opposite sides together & repeat. No waste at all. No help here though, unless you applique the edges on to a background fabric, making the whole a lot larger. I was going to ask if your Royal Show quilt was hand pieced? I’ts so neat! 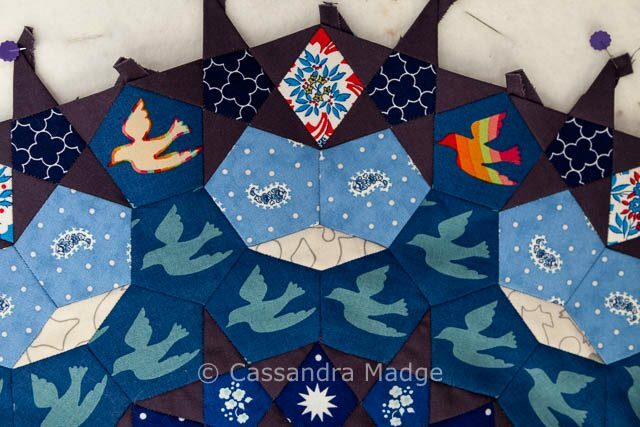 Thanks Cassie, i get tedious (as in time consuming) but fun to do I think & very effective for a blog. 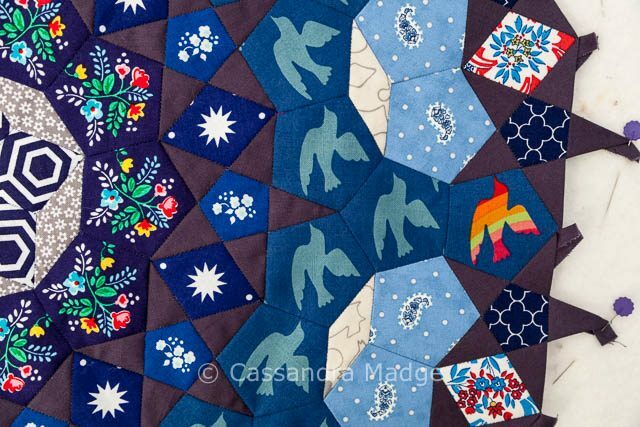 I was just at the Making the Australian Quilt Exhibition & noticed the many different ways people attached their hexagon quilts to background fabric. I will show you photos when I see you, finished in ways I haven’t seen done in a modern way. It looks amazing! This quilt is going to be an heirloom! I agree – I wouldn’t make those full half cogs either unless I had a plan to use them in another project. Your La Pas is absolutely beautiful! 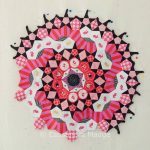 I was wondering how you achieved the layout page with the actual rosettes? I find myself wasting a lot of fabric because I end up not liking the way it looks.